We started using Terraform a few months ago as a way to create consistency and repeatability in the way we manage our infrastructure. Terraform is pretty new and not completely mature. While we are learning how to use it best, we picked up a few useful tricks along the way. I was going to call these best practices, but I don't think we have been practitioners long enough to really know if these are even good practices :-) Hopefully by sharing some of our learnings here, people can pick up a few things or tell us what we are doing wrong. While Terraform is a single binary and is as easy as terraform plan or terraform apply to run, you need a better strategy to run it with anything bigger than a few machines. Once your infrastructure is bigger than a few machines, you will probably want to break it down in smaller logical chunks. Also, terraform is pretty finicky about what directory it needs to be called from -- in part because of the way it loads files and in part because of where it looks for its state file. It quickly makes sense to use something to wrap the work in tasks. You can probably use ant, gradle or grunt, but these would add more dependencies to your project. So, back to the basics with make. Makefile files to manage tasks (and dependencies between tasks) have been around for a long time, and make is available on pretty much any Unix based platform (and that includes MacOS). While in theory it might be nice to think you can manage your entire infrastructure with a single setup and potentially a single command, practice proves different. You will quickly want to logically separate your infrastructure setup. For one, it will reduce the complexity of the number of files you have to manage. It will also make it easier if something goes bad. You don't want a single corruption of the state file to prevent you from managing your entire infrastructure. Or even worse, a bad command taking down part or all of your infrastructure. So far, we have decided to break down our Terraform project by services (app, API, etc.) and within services by environment (production, staging, etc.). With each service being independent and often managed by different teams, this was an obvious choice. The break down by environment lets us test changes before we apply them to our production infrastructure. This approach does have some drawbacks. You will find yourself duplicating quite a bit of code. Modules are here to help, but while we use them in each setup, we haven't explored using global ones yet. Also, if you have pieces of your infrastructure shared across all your services, you won't always be able to programmatically reference them. @echo "Getting state file from S3"
From time to time, it's possible you will corrupt your state file. And that's no bueno. So, we enabled S3 object versioning on all our Terraform state files. This way, if anything goes wrong, we can always go back to a known stable state. This one is probably not a best practice per se. Because we use multiple AWS accounts (for PROD v.s QA), it's not uncommon for us to run Terraform against one AWS account and then different account across multiple targets. On a couple of occasions, this caused corruption of our state file. Now, we delete our local state file with each terraform run: once at the very beginning just in case something was left from a previous (failed) run and at the end once we are done. With the use of make it's easy to pull the latest state file each time (see above). @echo "Clean up local state"
As the saying goes, that's it for now folks! Do you know of any other useful Terraform tricks? Drop us a note. Well, that’s a mouthful! But what is it and what is it useful for? If you have done any web development in the last 10 years you have most likely used AJAX to make your web pages or, even more likely your web based app, more responsive and dynamic. You also probably know that most browsers limit the number of concurrent AJAX requests that can be made back to the origin server (i.e. the same server the page is served from). Usually that number of concurrent requests is 6 to 8 (sometimes a bit more) depending of the browser. This might be fine for what you are trying to do, but if your page has a lot of dynamic components or if you are developing a single page web app, this might make the initial loading of your page, and all its content, a bit slower. After your first 6 (or 8) AJAX requests have fired, any subsequent AJAX query back to that same origin server will be queued and wait. Obviously your AJAX requests should be fairly fast, but even if your AJAX requests are just 50 milliseconds, any request after the initial 6 or 8 would have to wait 50 milliseconds when queued before executing. So in total a request could take 50 milliseconds (waiting) + 50 milliseconds executing = 100 milliseconds. This short waiting times add up pretty quickly. The solution? Make these requests look like they are going to different origin servers so that the browser will execute them in parallel, even if they are, in fact, going to the same server. This will allow more AJAX requests to run in parallel, and therefore speed up your site/app. Here I will show you how to accomplish this using JQuery (but the same strategy can be used with other frameworks). The basic idea is pretty simple. Say you are serving your pages from webapp.traackr.com. You will want to send some of the AJAX requests through webapp1.traackr.com, some through webapp2.traackr.com, some through webapp3.traackr.com …etc. You get the idea. And we will set it up so that all these hosts are, in fact, the same server. What I will show you here is how to do this transparently so you don’t have to manually set up each AJAX request and decide where it should go. Our little trick will randomly round-robin through all the available hosts. This will work even if your application runs on a single server and the best part is that if you need to scale and upgrade to multiple redundant servers you will have little if anything to change. Easy enough, right? Well of course, there is just one more little thing. When you start making AJAX requests to a host different than the original host, you open the door to security vulnerabilities. I won’t go into the specific details of the potential security issues, but suffice it to say that your browser won’t let you make these cross-domain (subdomain in our case) requests. Luckily, CORS comes to the rescue. CORS is a rule-based mechanism that allows for secure cross-domain requests. I will show you how to setup the proper CORS headers so everything works seamlessly. First things first - you will have to create DNS entries for all these subdomain hosts. 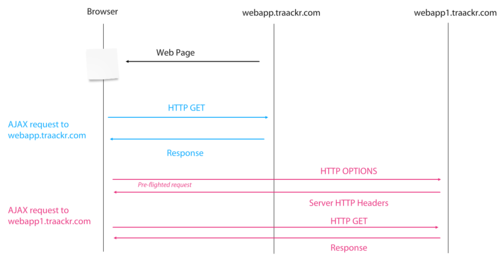 Because we are doing this with a single server, you need to create DNS entries for webapp1.traackr.com thru webapp3.traackr.com that all resolve to the same host as webapp.traackr.com (they can be AAA or CNAME records). All set? Moving on. Here we are going to leverage the excellent JQuery framework, so I’m assuming you are using JQuery for all your AJAX requests. Almost there. Now we need to make sure your server can handle these requests when they come via one of the aliases we defined. Because we allow credentials to be passed in these cross-domain requests, the origin allowed header ('Access-Control-Allow-Origin’) must specify a full hostname. You can not use ’*’, this is a requirement of the CORS specification. So what trade-offs are you are making? Remember this is engineering, there are always trade-offs! Well all of a sudden you might get twice (or more) as many requests hitting your server in parallel. Make sure it can handle the load. You will probably want to avoid hardcoding your list of servers in the script. Some corporate firewalls do not allow OPTIONS requests. This can cause this entire approach to fail. The script we use at Traackr will actually detect errors in OPTIONS requests and will fall back to regular AJAX requests. What can you do if/when you need to scale? One easy approach that doesn’t require you to change much is to put 2 or more servers behind a load balancer (maybe an Elastic Load Balancer on AWS). Then update your DNS so that all your webapp[1-3].traackr.com URL are now pointing to your load balancer. What magic happens then? Browsers will make more parallel requests, just as we have described all along here. But now your load balancer will round robin each of these requests to the many servers you have running behind it. Magically you are spreading the load (and the love). Thank you to the entire awesome Traackr engineering team for the help with this post. We are Traackr, the global and ultimate Influencer Management Platform. Everything you need to discover your influencers, manage key relationships, and measure their impact on your business. Check our blog. We are hiring. Real Redis cluster is finally here. This is exciting news! Shorter debugger ever? Could be and can be very handy. A tweet-sized debugger for visualizing your CSS layouts. Outlines every DOM element on your page a random (valid) CSS hex color. We have been using the Yahoo Maps Web Services for a while now and had been really happy with it. We use it to try to better understand where @traackr influencers might be located. You know, when someone says “big apple”, we can convert that to “New York, NY”. But Yahoo decided to shut it down and finally pulled the plug completely a few days ago. It was time to switch. We had 1 guy in SF, 2 guys in Boston and 1 guy in Canada work a new solution, make the code change and switch to a new service and test. All in about 1 day. Oh, and our engineer who deployed the code to production did so during a flight back to the east coast at about 30,000 feet. I have to agree with @parislemon on this one. Chrome has become very bloated. I can see it from the amount of memory it requires just to have a few tabs open (ok, some people in the office will argue that very often I have more that “a few” tabs open, but still). I also found that Chrome is being very aggressive with it’s caching strategy. When developing locally, it’s pretty annoying when even a hard reload will not re-fetch all resources on your page. In my experience (and I know at least a couple of people in the team with the same problem), it takes closing and re-opening Chrome to clear whatever Chrome think it should cache. Please don’t make it go back to Firefox for everyday browsing. Yoda conditionals… Change my mind I should?